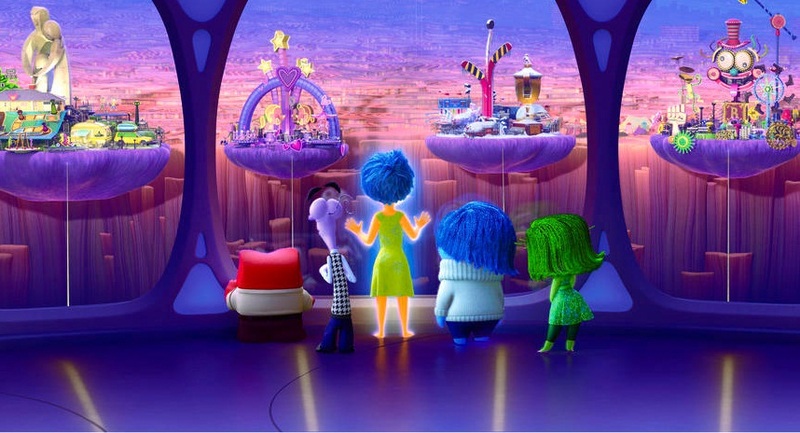 Pixar returns with its remarkable imaginative adventure ‘Inside Out’ with the most universal and simple idea: what goes inside a child’s mind, through an 11-year-old hockey-loving Midwestern girl Riley. 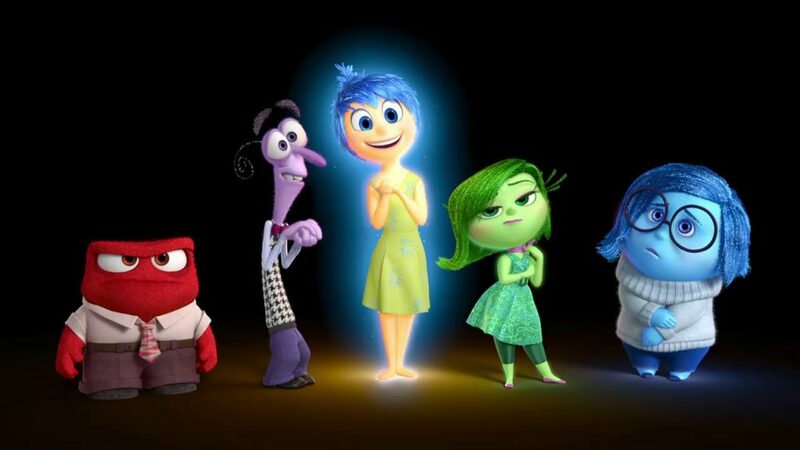 In the movie there are two parallel worlds: everyday life events perceived by Riley and her emotional reactions towards them that actually goes on inside her head, which is populated by the sparkling Joy (Amy Poehler), mopey Sadness (Phyllis Smith), gangly Fear (Bill Hader), hot-headed Anger (Lewis Black), and trendy Disgust (Mindy Kaling). Joy, Sadness, Anger, Fear and Disgust all are personified as cartoon characters: Joy emphasizes on her happiness, Fear stops Riley from getting hurt, Disgust reduces exposure to potential contaminants, forms her taste in food, in fashion and in social skills, and Sadness occasionally sneaks onto the controls, making her cry. All try to make sense of the upheaval. Her world turns upside down when her family moves from snowy rural Minnesota to the hustle and bustle of San Francisco, where her father plans to start his own business. Riley’s emotions wrestle so hard with homesickness and fitting in at a strange school in San Francisco but turmoil ensues in Headquarters. 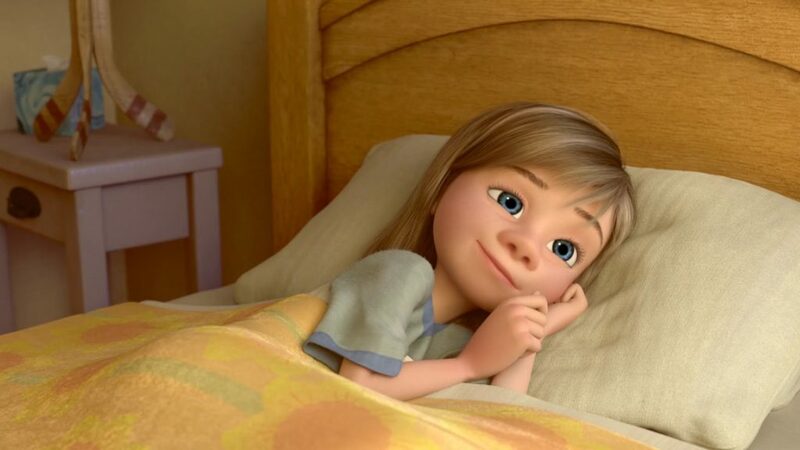 Although Joy, which always ensures Riley’s happiness, attempts to keep things positive, but all her emotions conflict on how to steer a new city, house and school. ‘Inside Out’ shows personality Islands as anchors of personal preferences that pave the landscape of our individual values. The Islands are named Family, Friendship, Honesty, Goofball, and Hockey. These ‘Personality Islands’ mark the different sides of Riley: her love of hockey, her goofiness, her bond with her parents, which altogether defines who she is. The personality islands shape us into who we are. We may lose some of the personality traits as the time passes but only to gain some others in return. This concept is an interesting glance into our priorities and how they influence us in identifying ourselves. This ‘psycho-revolutionary’ film puts so much importance on our feelings and childhood development. Joy and Sadness often work in tandem, though exuberant, witty and entertainingly energetic Joy adamantly undermines and isolates Sadness to keep Raily happy but soon she realizes that expressing sadness doesn’t really take away your happiness, rather it is sometimes enriching. 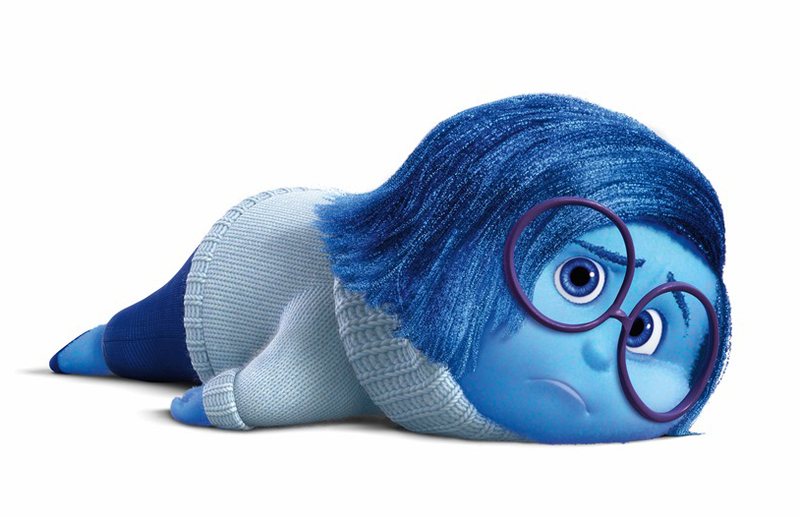 Sadness is not a sluggish nuisance, but a physiological response towards the signals to respond. This is what happens when we experience profound loss. When Joy realizes the importance of Sadness, the natural emotion in the face of loss, she takes her assistance to help Riley to appreciate loving bonds and return to her family. Raily’s journey is really exhausting, interspersed with moments of excitement. Her journey makes us realise that our emotions maintain a tenuous balance that can be disturbed by external events but unlike every emotion, Sadness has such an significant role in everyone’s life. Sadness prepares us for the emotional challenges we’ll face in the future. It also means we should be better prepared to deal with the impact of trauma, and suffering that life will throw at us. 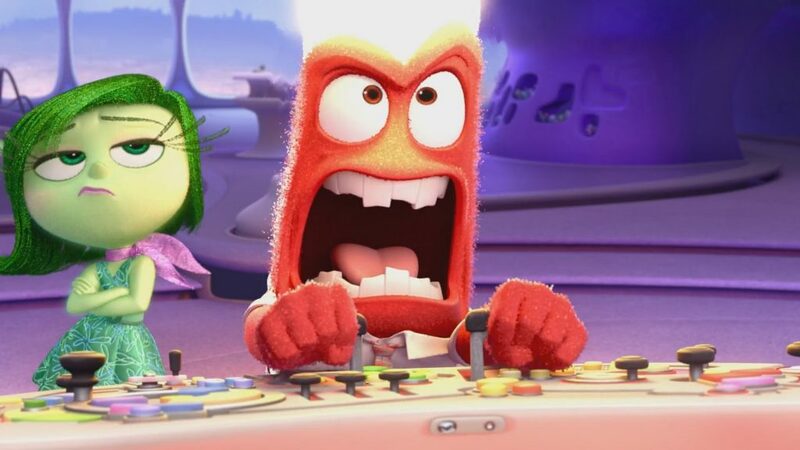 In the movie, Anger is extremely reactive, grumbly, and prone to outbursts characterized by flare-up of flames atop his head. It reflects that Anger, in form of frustration, visits us quite frequently as it has been a constant figure in Riley’s infancy but we need to know if it is really required? Anger, in proportionate, is certainly good. As the film spells out, Anger evolved for clear reason by protecting Raily from others and allowing her to be a better hockey player but when Anger takes charge for a long period of time, our brain logically stops functioning. Consequently, we cannot make rational decisions. Fear is an innate spontaneous response in every person with the purpose of keeping one safe and secure in the face of potential danger. However, it’s dangerous when fear is overactive, which actually causes one to be groundlessly afraid of fictional circumstances. In Raily’s life, Fear is anxiety-ridden, jumpy, ridiculous and tends to predict catastrophes (which will not necessarily come true). Fear ponders over too much ‘what-ifs’ and ‘could have beens’ in life, and always concludes that the outcome will be devastating. 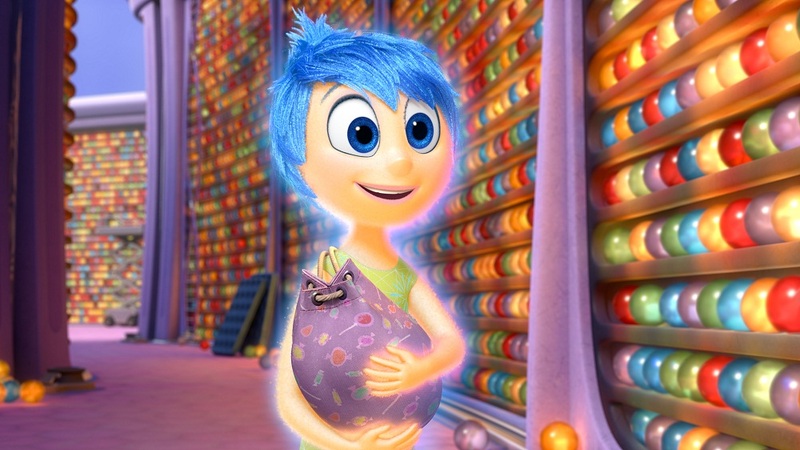 In the Movie Joy ensures Riley’s happiness all the time, which is an overarching and unachievable goal. Happiness doesn’t mean one should experience bliss, gratification, or positive well-being all the time, which actually means there is no space for other vital emotions without whom ‘feeling that life is good, meaningful, and worthwhile’ is not really possible. Remembering that joy is just one component of happiness, but happiness can be tinged with other emotions like Anger and Sadness. A current research confirms that people who experience variety of both positive and negative emotions, have better mental health. Different emotions depending on different circumstances prepares one with detailed information about a specific situation, which means you will have a better vision to choose better attitude towards a particular situation. Problem becomes worse when you try to impose something forcefully on yourself. When Riley’s mother tells her to be a ‘happy girl’ when her father goes through a difficult period at work and to adjust a stressful cross-country move. As a child, we all have faced such situation and more importantly we live in such a society where you have to be or at least pretend to be happy which leads us to the road of emotional supersession and consequently dreadful outburst. But significantly, forcing herself to be happy doesn’t help Raily to deal with stress, depression and transitions in her life, rather it aggravates her irritation towards circumstances and angry with her parents. It’s a very crucial emotional lesson that prioritizing positivity or emphasising on happiness does not require your denial of negative feelings. Accepting the situation triggers healing process faster and better. Riley’s acceptance of truth that moving to San Francisco has been tough for her finally solves the problem that brings her closer to her parents. Joy always tries to isolates Sadness by drawing a small ‘circle of Sadness’ and instructing her to stay within it just to prevent from having her influence on Riley’s psyche. In reality what Joy does is trying to suppress a pivotal emotion, which leads to anxiety and depression and it is prominent in amongst teenagers whose understanding of their own emotions is still under construction. Instead of denying, identifying every emotion who she is and what’s her role is very important part of emotional development. 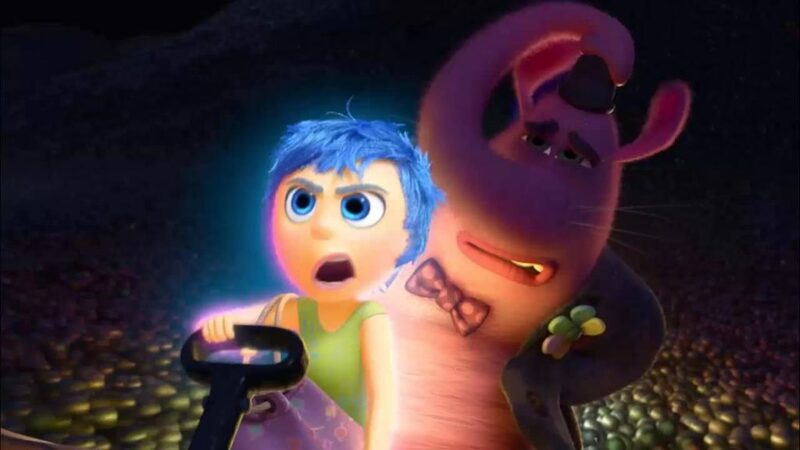 In a point, when Bing Bong loses his wagon, Joy encourages him to remember and redefine what this loss means for him. Such behaviour is called ‘ Cognitive reappraisal’, a strategy to effectively and positively divert negative emotions. Mindfully embracing such emotions can help a lot, that means instead of getting swayed by emotional reaction, listening and observing them carefully and choosing the right response towards the situation. The film introduces the concept of a “core memory” that is the engine to Riley’s various personality traits which make her love for hockey and nurture friendship, and practice honesty. 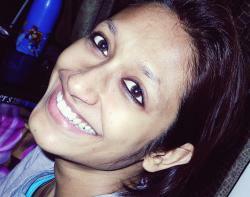 This film has provided a basic idea of memory banks and how such memories are formed, and there’s a truth lying here. Our memories and perception towards them help form our subsequent behaviour that shape our experience and influence our emotional development and together it helps form our sense of identity. There is a point when Joy watches as Sadness comforts Bing Bong by listening and echoing his disappointment. Until then Joy’s inclination is to distract from pain, but it changes her perception about the role of Sadness. She realises that suppressing it may not solve the real problem and allowing sadness to take over for a while can help the person move on. Riley’s childhood imaginary friend Bing Bong attempts to escape from the Memory Dump with Joy in his wagon rocket, but soon Bing Bong realizes that his wagon wouldn’t be able to take their combined weight so he sacrifices and jumped out of the wagon rocket. Bing Bong is left in Memory Dump forever. It’s hard but you have to sacrifice certain memories just to collect more than them. Loss also provides closure and growth. 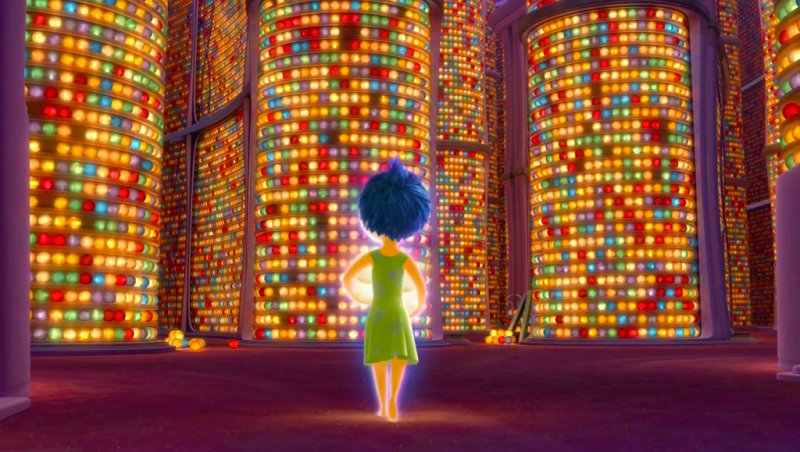 Inside Out is such an important ‘teaching tool’ for parents who can help their children learn the role of emotions. Emotions are strongly conveyed to offer a foundation for discussion among kids and adults alike. It makes us feel that our educational curriculum should emphasize on the teachings of ’emotional literacy’ specially to young ones to have a grasp over their emotions, better which actually will help them reach their dreams, and achieve real happiness. This movie has given another insight that has been felt by the most: ‘Sadness is equal to depression, which is nonsensical in every depth. Parents should help children to realize that depression is simply ‘a mood disorder’ that lasts for prolonged periods of time’ but sadness is simply to feel low sometimes just to freshened up for the next. More importantly we adults should ensures that we create safe environments for our children so they openly discuss and ask for help if they feel sad or depressed.